I made this cake for my daughter’s first birthday. We have her whole nursery decorated in frogs so I thought it would be appropriate to browse through the frog cakes on this site and come up with an idea. I made three 9" round cakes and one 9" square cake. I used a round cake for the body and trimmed a small strip off either side. I used a round cake cut in half for the legs. I had made a paper stencil which I laid on top of one half of the cake and traced with a knife. When I had that leg cut out I flipped it over onto the other half of the cake and did the same. I cut the head shape out of the square cake and cut eyes out of the scraps. I had one round cake leftover which I used trimmings of to fill in some gaps. Then I free-handed the frosting on to look likes a red-eyed tree frog. It took me almost 5 hours to make but the funniest part was the five minutes it took my daughter to dig her hands in and destroy it. 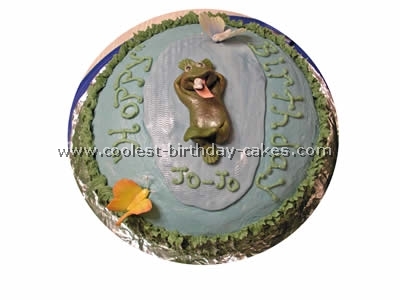 I made this frog cake from a basic 9 x 13 cake frosted in blue. I used a zig zag design on the edge. It was my first time and I think I decided that I prefer scallops. The lily pad is made from vanilla chocolate that I melted and colored green. I just spread it on wax paper in the shape I wanted. 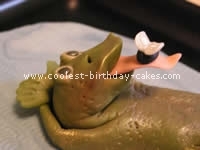 Then I stuck a toy frog on a dollop of frosting on the lily pad. 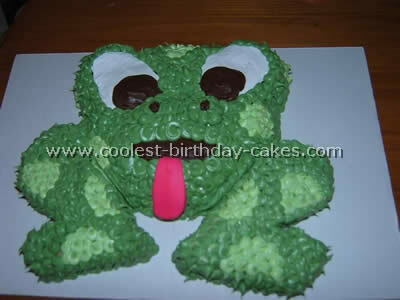 Thanks for all the great frog cakes on this site! 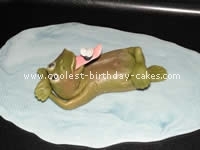 I made this frog cake using a 3D bear pan. I just turned the ears of the bear in to the frog’s eyes. 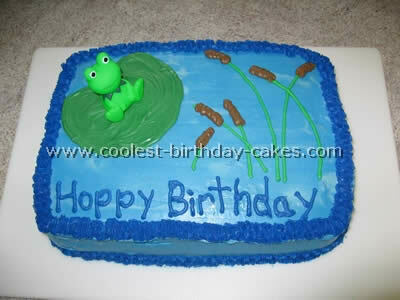 The bottom is just a round cake I cut a triangle out of to make the lily pad. My son who turned two, and my daughter who turned one, wanted frog cakes for their birthday. I made the body out of chocolate cake (using the Wilton Cake Pan called "Animal Crackers") and made the legs out of a sheet cake. 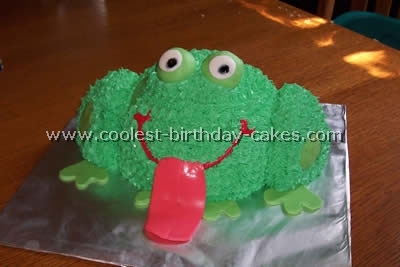 I used two different colors of green frosting to create the Frog Skin. I used pink fondant for the tongue. I made this frog birthday cake for a family member’s Birthday. He had a pond on his property literally over-run with frogs! The frog part of the "water" fly and butterflies are made of fondant. All were hand-sculpted. A good way to find techniques that work best for you is to practice with modeling clay. For me the clay and fondant have similar textures and weight. The cake is a basic pound cake with buttercream icing. I piped "pond grass" around the sides using a leaf tip. This was a very fast and easy way to decorate the sides. I textured the frog using a toothpick to dimple the "skin" and dusted lightly with gold luster dust (you can find this at Micheal’s made by Wilton). I also lightly brushed his belly and cheeks with grated non-toxic pink chalk. 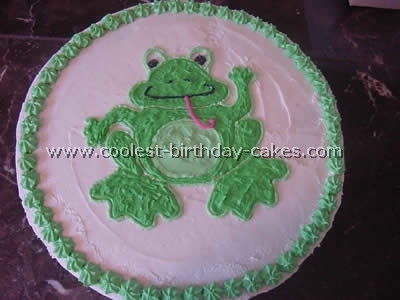 My recommendation is to have fun while making your frog birthday cake and think outside the box circle triangle. Good luck with your frog cakes! This frog birthday cake was made for my nephew’s first birthday. I baked a regular sheet cake and a pan of cupcakes. 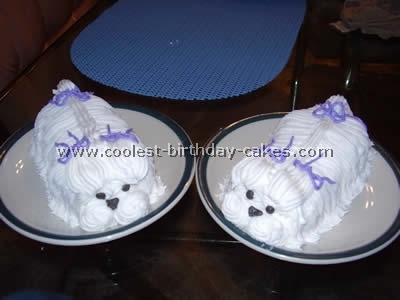 I then decorated the entire sheet cake with blue icing. Then I took the cupcakes and placed them along the back edge of the cake to make it look like the bank of the pond and covered them with brown tinted icing. I took toothpicks and rolled tootsie rolls up and placed on the ends to look like cat tails. The lily pads as well as little mushrooms were sugar paste. And the rocks were left over tootsie rolls. The sand was butterscotch pieces. The frogs were candles. 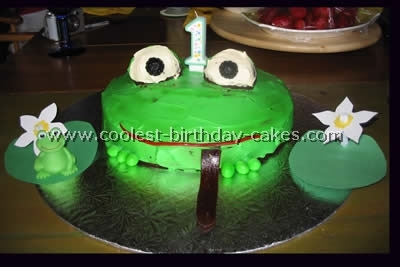 I made a slight hole in the cake and placed one of the frog candles down in it to look like he was submerged in the water. I made these frog cakes for my son’s 8th birthday party which had a science theme. He wanted dissected frogs. I started out by making a 9X12 sheet cake. Online I printed a picture of a dissected frog and used this as a template to cut out the shape of the frog. Then I cut a hole out of the middle of the frog’s stomach to place the "guts" in. I used Fruit To Go as the "skin" that was pulled back to reveal the guts. I used T pins to pin it back as they do in a real dissection. 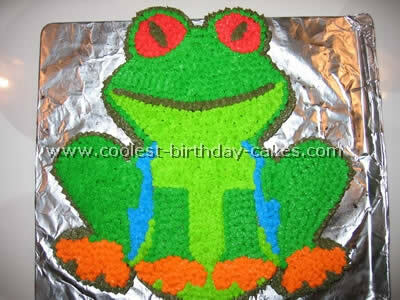 I iced the cake with a light green on the top (which is the bottom of the frog) and used a darker green on the bottom (which is the top of the frog). I used 2 chocolate chips for the eyes. 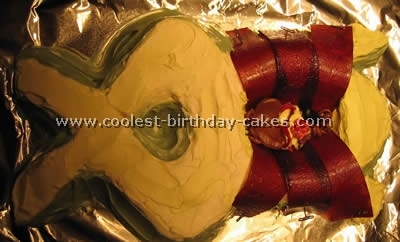 For the guts I used different colored and shaped jelly beans a tootsie roll – shaped into a kidney and intestines. The effect was great. All the boys loved seeing the guts of the cake! All I did was print a picture of the frog from the internet, cut it out, laid the cut out on the iced cake and traced around the edge with a toothpick…then I filled it in. 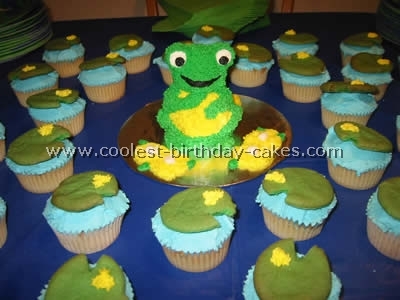 Frog cakes can be simple to make! 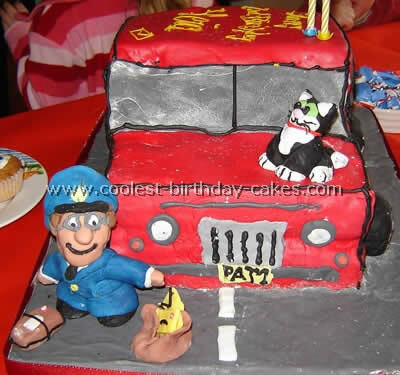 This cake is really cool. 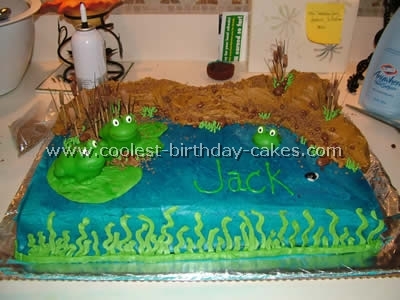 My nephew wanted a frog cake where his guts spills out once you cut it! I used a Betty Crocker filled cake pan for the body. Inside I put vanilla pudding tinted green and 6 little plastic frogs. The hind legs are made from the sports ball pan, cut for the right height. I also used dowel rods to make sure the hind legs would not fall off. I used Betty Crocker icing to cover the body and fondant for the eyes, spots, tongue and feet. To make the blue eyes I used a paintbrush and painted the food coloring straight onto the white fondant. It is a very heavy cake so make sure you use a strong piece of cardboard underneath. 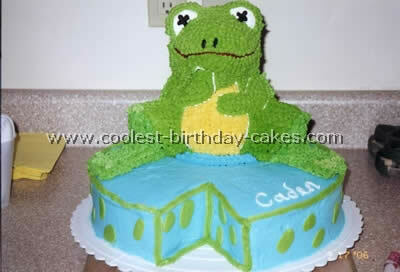 Have fun creating your own frog cakes! 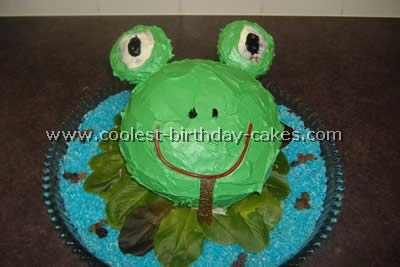 To prepare these kinds of frog cakes, I used a cake mix in my large, glass Pampered Chef mixing bowl. It can go right in the oven. After it cooled, I used a knife to scrape the edges and turned the bowl upside down to get the cake out. I then iced the cake with green icing. I used red shoestring licorice for a mouth and two dots of black icing for the nose. For the frog’s tongue, I used a cut up piece of fruit leather. I made cupcakes and used two of them for the eyes. I iced the cupcakes around the outside with green and in the inside with white icing. I then used black icing for the pupils. I attached them to the back of the cake using dry spaghetti (they didn’t stay for long though— it may be better with chopsticks). I then placed the frog on a bed of dyed blue coconut (just mix blue food coloring with white coconut). I used lettuce leaves in the middle for a lily pad. I put groups of three raisins around the coconut to look like flies. My son loves frogs, so I wanted to make a 3D frog cake for his 1st birthday. I could picture it in my mind, but I had no idea how it would turn out. IT was the hit of the party. I used a 10" round pan, and doubled the recipe to also make cupcakes. I used cupcakes, cut in 3/4 for the eyes. I used a low sugar icing, just cream cheese and maple syrup. It came out very good. I tinted the icing green but set aside some white for the eyes. I also used black jujubes for the eyeballs. The mouth is skinny red licorice, and the tongue is a fruit roll-up. The frogs toes are peanut M&m’s. The lily pads I just made out of construction paper. I wish you the best of luck with your own frog cakes. The frog is made with Wilton’s mini stand-up bear pan. I iced all of the cake green and the belly yellow and put eyes where the bear’s ears are. I made feet with icing on the board (so the bears feet are the frogs legs and the frogs feet come out from there). The lily pad cupcakes are covered in blue icing and I baked sugar cookies with green food color. When they cooled I cut out a notch and added a yellow flower, then placed them on the blue icing.